If you are a golfer and you want to combine your cottage getaway with a few rounds on the nearby links then you will be pleased to hear there are plenty of places in the UK where you get the best of both worlds. There are hundreds of top quality golf courses dotted around the United Kingdom plus some really great, lesser known courses that might not get the same high volume of visitors, making them perfect for a quiet round. Take a trip to Cumbria, as there you can enjoy the beauty of the Lake District, the hiking trails and the water-sports, book a self-catering cottage for the duration of your stay and you can use it as the perfect base for touring the area and trying out all the local courses. Silloth on Solway is thought to be one of the best courses in the county with a perfect location and miles of fabulous views. Located on the coast beware of the sea breezes when taking your shot. Inland you can play at Kirkby Lonsdale Golf Course in the Lune Valley, which takes full advantage of the views of Howgill Fells on the 15th green. 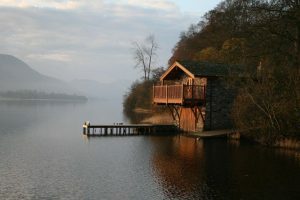 You might be wondering why, when you are surrounded by the beauty of the lakes you should stay in a cottage rather than camp and get back to nature, and yes while many people enjoy camping, if you stay in a cottage you are almost always guaranteed to get a good nights sleep, where if you stay in a tent the weather, other campers and local wildlife can all contribute to a disturbed night. Cottages are a home away from home, and if you are holidaying with a family, especially those with small children, a cottage is a safer and much more secure place to be.